Deal Book. Obagi Medical Products Incorporated is a boutique aesthetic and skin health care shoppe that blossomed out of their 1st floor office in Long Beach, California. Its annual sales are about $120 million; the cost of sales is $25 million; and the selling and administration expense is $66 million, for a net operating profit of about $27 million per year, net of $2 million in research and development expense. The company doesn’t pay dividends and is “worth” $271 million at the Risk Price (SF) of $16 per share, but “beauty is in the eye of the beholder” and Valeant Pharmaceuticals International Incorporated has bid $24 per share today ($418 million) to top a recent but earlier bid of $22 from the German-based rival group, Merz Pharma GmbH, and the stock closed at $25 today in anticipation of higher prices yet to come (Reuters, April 3, 2013, Valeant Pharmaceuticals in bidding war for Obagi Medical after boosting offer). However, the real action began two weeks ago, on March 20, when 16 million (of 17 million outstanding) shares changed hands in one day and, in the past two weeks, 27 million shares have changed hands, and still not everybody is happy, alleging that the company has not been “shopped around” enough in the pursuit of “shareholder value” (Globe Newswire, New York, April 3, 2013, SHAREHOLDER ALERT: Levi & Korsinsky, LLP Notifies Investors of Claims of Breaches of Fiduciary Duty by the Board of Obagi Medical Products, Inc. in Connection With the Sale of the Company to Valeant Pharmaceuticals International, Inc. — OMPI Press Release: Levi & Korsinsky, LLP). Why are we telling you all this? Well, we find it to be amazing what investors will do when they don’t know what they’re doing. Somebody sold Obagi today for $25 – which is probably a good move for them – and somebody bought it today for $25, which is a gamble, and 4 million shares have “changed hands” in the last two days between $23 and $25. The speculation is that Valeant will be able to cut the selling expenses by $40 million per year (currently at $66 million) and that the company is a “good fit” for their international aspirations, as it is for the Merz Group. We’re covering up and although there are no call options available, we’ve bought the May put at $25 for $0.65 per share, so that we might further tan without getting burned, so to speak (please see Exhibit 1 below). 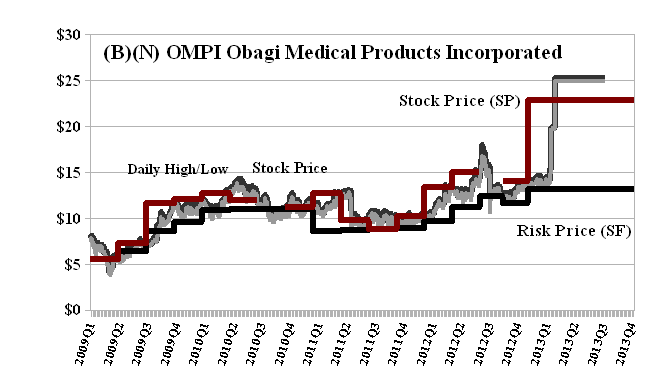 Obagi Medical Products Incorporated is a pharmaceutical company focused on the aesthetic and skin health markets. We only buy or hold a stock in the Perpetual Bond™ if the ambient stock prices appear to be above the Risk Price (SF) (Red Line Stock Price (SP) above the Black Line Risk Price (SF)), regardless of what people think, and we tend to buy early, in this case $10 in 2011, and again at $14 last year (respecting our One Rule). On the other hand, Valeant Pharmaceuticals (which merged with the former Biovail Corporation in 2010; please see, U.S. SECURITIES AND EXCHANGE COMMISSION Litigation Release No. 21938 / April 19, 2011, Accounting and Auditing Enforcement Release No. 3271 / April 19, 2011 Securities and Exchange Commission v. Biovail Corporation, Eugene Melnyk, Brian Crombie, John Miszuk, and Kenneth G. Howling, 08 Civ. 02979 (LAK) (S.D.N.Y. filed March 24, 2008)) has been one of the hottest stocks on the Toronto Stock Exchange and is up over 30% since December (please see our recent Post, S&P Winners & Losers, March 2013) and, again, it’s been our good fortune to be in the right place at the right time (please see Exhibit 2 below) but, of course, we’re checking our options. 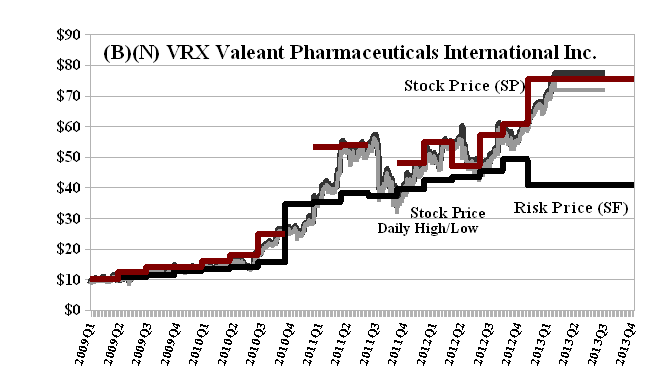 Valeant Pharmaceuticals International Incorporated is a specialty pharmaceutical company that develops, manufactures and markets a broad range of pharmaceutical products primarily in the areas of neurology, dermatology and branded generics.